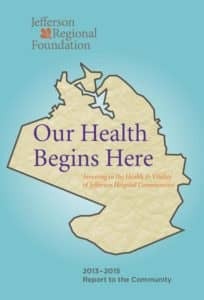 Our Health Begins Here is the Jefferson Regional Foundation’s first Report to the Community, covering the period of July 1, 2013- June 30, 2015. With a focus on the “social determinants” of health, the Foundation seeks to fulfill its mission to improve the health and well-being of the Jefferson communities. The Foundation understands that place matters because in the matter of health, “your zip code may be as important as your genetic code.” The Report includes grant priorities and application guidelines, grant awards, Board information, and an overview of the first Jefferson Forum. We would be happy to provide print copies of Our Health Begins Here for your convenience. Simply contact us at 412-267-6770 or foundation.info@jeffersonregional.com.